Iyama, playing as the Japanese NHK cup winner, lost to Lee Sedol (Korean KBS Cup winner) in the 1st round of the Asian TV cup. NHK runner-up Ichiriki Ryo did beat the surprise (beat Ke Jie in semi-final shortly after winning EGC) Chinese CCTV cup winner Zhang Tao though. P.S. oren, in some of those pictures there are coloured percentages above the board. Are these predicted win rates from a bot like Zen, viewer voting/betting, or something else? For a fifth-ranked player in the world (according to Goratings), Iyama seems to lose a lot of games to players ranked lower than he is. The game lasted only 118 moves. Hardly a performance I'd expect from a world #5 on Goratings. Of course, Shin is ranked higher than Iyama, but the their ELO ratings are separated by merely 35 points. Why do you think game length should be related to playing strength, or strength difference? It is entirely possible to get into a large complex fight, lose it, and resign, at pretty much any playing level. EDIT: Oh, sorry, I didn't realize you were just trolling. Please feel free to shut up now. TheCannyOnion, these 2 posts were made in a topic "Following Iyama Yuta (no world ranking discussions)" and are therefore not allowed there. I have moved them here. That's nothing! 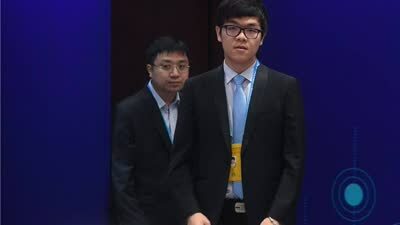 Every game that Ke Jie has lost has been to a player ranked lower than he is! I thought about specifying every human player, but thought that might be placing accuracy above the joke. I've a hunch that it might be a joke, actually I'm quite sure it's a joke, but AlphaGo force me to do this! To be fair, it's only partially a joke. It's just making the observation that saying a very high ranked player has lost to players with a lower ranking doesn't really tell us anything useful. For instance, at the peak of his rating Lee Changho, one of the most dominant players of any era, won about 83% of his games. Lee was the undisputed top player in the world at that time, so by definition he lost nearly 20% of the games he played to lower ranked players. In 2015, the last year with data on Sensei's Library, Iyama won about 79% of his games (where can I get current win rate data?). People who feel Iyama is over ranked like to point out that most of these wins were against significantly weaker domestic competition, which is a valid point, but simply saying Iyama lost to a lower ranked opponent doesn't really tell us whether or not he's living up to expectations. That requires a statistical analysis of his wins and losses which is, of course, what a site like gorankings tries to provide. I think that there's a valid argument that it doesn't properly handle regional variations in strength and thus gives Iyama an inflated rank, but the proper way to argue that (in my mind) is with math, not insults. For what it's worth, I think the thread you linked provides a good critique of the gorankings system, and I think mamumamu's rating system that puts Iyama at world 27 is reasonable. That doesn't mean he can't beat a top player on a good day (anyone in the top 50 is really strong! ), but it does mean it's a bit of a remarkable result if he comes out on top in international competition. I know this thread is not about world ranking discussion, but one significant event is that Iyama has just dropped to 11th position in Goratings. A while ago, I suggested that to keep his high position he needed to maintain a winning rate of 80-90% against his Japanese opponents. Nobody can do that forever - the long term winning rate for those very top players (Lee Changho etc) is often at somewhere between 70%-75%. I disagree, though we've been through this before. What you're saying amounts to the rating system being broken. Perhaps it is, but my gut says that if you put Park Junghwan in Japan, he'd sustain that performance for many years. It's just that while Iyama is very good, he's not at the absolute top. Just a bump to bring this thread back into prominence so that we do not derail the "non-rating" thread with ratings discussions. If an administrator could move the last couple of posts from that thread to here, that would be appreciated. Perhaps it is, but my gut says that if you put Park Junghwan in Japan, he'd sustain that performance for many years. Actually, although I agree that Park at his current strength would probably maintain 80-90% win in Japan, if he stayed there for many years and didn't keep playing top Korean/Chinese I suspect his level would fall as he would get sloppy and decline without the constant practice against similarly strong people. Anyone notice Iyama's ranking at Goratings has been dropping like a rock? In the three months, he's dropped from being top five to 16th as of today. Perhaps it is the result of other players in Japan winning against him. They may have been slightly underrated until now. 5 straight losses will do that to you. And other top players are seeing their ratings improving due to consistently stronger competitions, so even if Iyama’s rating had stayed at his all-time high, he would still be only No. 10 on the list. Right, Iyama has been having more losses lately both domestically and in the extra international matches he's done, plus the ratings of people at the top has been increasing. Iyama's all-time high rating was something like 3586 and #3 at the end of last year (https://web.archive.org/web/20171205171 ... gs.org/en/), though if you look now at what it thinks his rating was then it's only 3534 due to the way WHR retroactively updates the past based on present information. Back then 3540 would get you world #5, now it only gets you #10, there's been a big growth in the number of players 3550+. Lee Sedol is a top player though who has seen a bigger decline than Iyama: back in Jan 2016 he was #3 with 3553 (Iyama close behind at #5), but now he is down to #22 with 3478. Yeah, and Gu Li, Lee Sedol's main rival, has fallen all the way to #75, three years after his last international title. Iyama has dropped all the way to 39th on Mamumamu's ranking. He was ranked 15th at the beginning of 2018. Iyama has dropped all the way to 21st on Goratings.org. On Mamumamu's ranking, he is now down to 44th. Iyama is now down to 26th place on Goratings.org. If he loses to Yamashita Keigo again, he's likely out of the top 30.